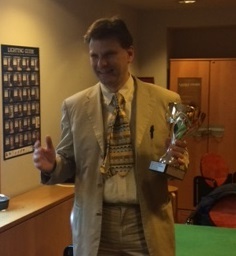 Frank Hoffmeister blitz champion 2016! As in previous years, the blitz tournament covered the entire year 2016. 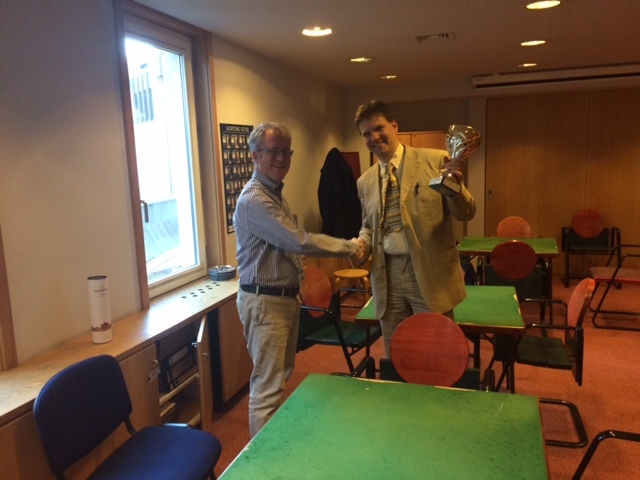 Out of 20 events, tournament director Jesper Abrahamsen counted the 15 best results of the participants to determine the winner. The temporary departure of last years’ winner FM Carl Buhr let some space for other players. And indeed, the race was tense until the end. For a long time, Martin Müller led the field with a strong performance on almost every Wednesday. Only on the very last Wednesday, on 14 December, club President Frank Hoffmeister was able to catch him with 4/5 performance (behind FM Georgi Tomov with 4.5/5), while Martin contested at the London Chess Classics. This brought him slightly ahead of Martin in the overall statistics. In a small ceremony Jesper congratulated the new blitz champion and wished him good luck for 2017!